Our household was up and doing before first light. Our mistress had ready a bottle of ale, and was wrapping little breads. The master’s sweetheart came by soon after with her son. They had refreshments in a bag. Linkin and I, not liking visitors at dawn, went upon our roof for quiet. There we saw a sight. A glummish procession of barges was coming up the river. Essex and our Earl being carried from the Tower to Westminster Hall. Many were about that morn. None durst do more than whisper blessings. There were men with muskitts in the barges, lest any should attempt a rescue. The master had paid a waterman to await him at Black-Fryes stairs. He sayt ’twere best they went early, because the ways all about Westminster Hall would be throng. We went to warm ourselves at our hearth. Linkin told me that first to enter the Hall would be the Judges and the Queen’s Counsel. Then the Lord High Constable of the Tower would bring in the Earls. The Gentleman Porter would carry the ax before them. 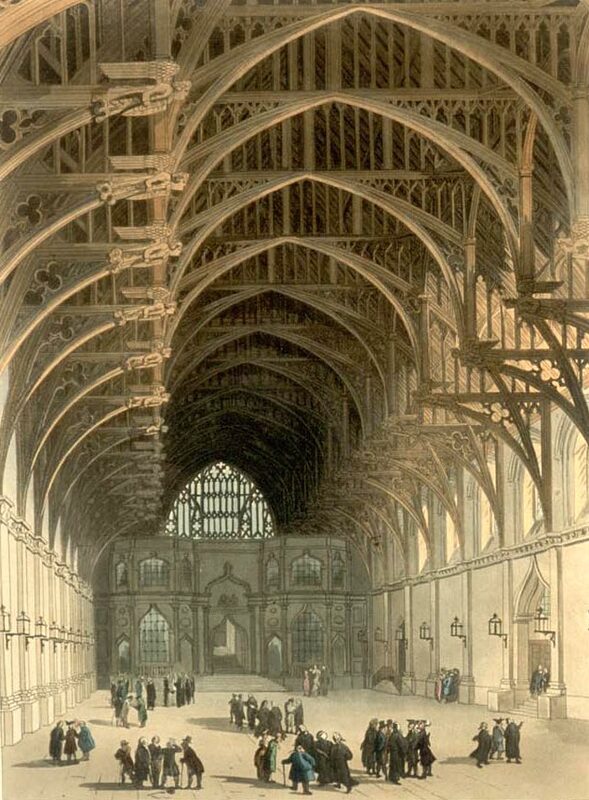 Westminster Hall in the early 19th century. It probably looked much the same, though not empty, when the Earls were tried in 1601. Then Luvvie the Player sayt that this were the greatest show in London. How he envied the cats that keep Westminster Hall! They would see and hear all, and what an entertainment they could make of it for their friends. I told him to keep his thoughts to hisself. Else I would write to Sir Rabbit. And tell him of a cat that came across the river with the complices who bespake the treasonable play, and where that cat might be found. That so affrighted Luvvie he troubled us no more that day. Then Linkin sayt he knew his own days were numbered, but he daily thanked the Queen Cat of Heaven that he’d lived long enuff for this. The greatest trial here that ever was held in the reign of Queen Puss. “What of the trial of Scotland’s Queen whose days were ended by old Lord Purrlie?” I arrkst. I forgave him that snib. He were the last cat from my kitlinghood, and when he went from this world there would be none betwixt me and the dark to which all must return. Then, lest he grew too fragile hisself, he would go to the kitchen in search of choice meats. But it was a long, meatless day that Linkin and I endured, awaiting newes of the trial. ’Twas after dark when our mistress, the master, and their friends came in, crying of their need for drinks as they hasted to the master’s chamber. Linkin and I ran with them. The gentlewomen were speaking kindly of the Earls, the gentlemen unkindly of two men I knew not. Alas. Even as I settled myself to hear more I was troubled by sudden wamblings in my womb. I could think of nowt but a dish of well-cooked bacon. Such wamblings are a thing we poor queen cats must endure. They’re caused by the little wrigglers in the dark that take every word we hear into their bellies before they’re grown enuff to have brains. But, kitling-brained and longing for bacon as I now was, I hearked all that was said around me and will set it down as best I can. 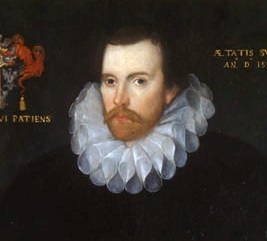 Leading the prosecution was the Attorney-General Sir Edward Coke (1552-1634), with the solicitor Francis Bacon (1561-1626). Essex had originally been Bacon’s patron and friend, and had tried to get him appointed as Attorney-General. When the position went to Coke, Essex unsuccessfully pursued the position of Solicitor-General for Bacon. Bacon knew Essex well, and had been one of his chief advisers. In the small world of the Elizabethan elite, he was also Sir Robert Cecil’s cousin. 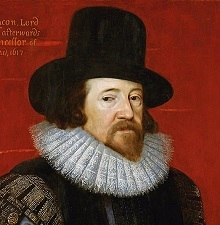 Bacon distanced himself from Essex in late 1599. As one of the Queen’s solicitors he had little choice, but his appearance for the prosecution might still have raised a few eyebrows. There was no defense counsel in those days. The Earls of Essex and Southampton defended themselves. Not an impossible task for the extraordinarily well-educated, who were often trained in disputation at university, but more difficult for everyone else. The trial lasted from somewhere between 8.00 and 9.00 in the morning until almost 7.00 in the evening. Did the spectators take snacks and drinks into the Hall with them, or did they fill up before they went in? And what of other necessary breaks? I don’t know. I’ve heard what Elizabethan theatre audiences were inclined to do in the days before intervals… . But at a trial? On the august floor of Westminster Hall? There must have been breaks. Surely the prosecutor himself needed to retire occasionally for food and drink. I think we have to accept, though, that our ancestors were, of necessity, a lot less choosy than we are about what they did and didn’t do in public. I think the prosecutors, judges, etc could have been able to move in and out. I’ve read a couple of accounts of how the Hall was set up for the trial participants, but I’m not sure how the spectators got on. I automatically assumed that there must have been some scaffolding put up for seating for the “better sort”, but when I stopped and thought about it …. I’m keeping an eye out for more details, but of course they’re not the sort of thing people of the time would have thought worth recording. It’s possible that in the spectators area, people were moving about all the time. Some of them might have had servants with them to carry chamberpots back and forth. I suppose there might even have been chamberpots around the room. Everything hangs, I suppose, on how crowded the hall was and how likely one was to lose one’s space if one left. It wouldn’t have taken long for the smell to be dreadful if people didn’t leave or use chamberpots that were emptied. I wondered about the possibility of servants trotting to and fro with chamberpots, as well. I’m also wondering about how “public” the trial was. Space in the Hall would have been limited, and the trial would have been of great interest to friends and family of all participants, and to the legal and related professions, etc, so possibly places could have been unofficially reserved? Or you got in if you knew someone who knew someone etc? Perhaps there wasn’t much of an audience at all and all the spectators were outside having news relayed to them. Was it trial by peers then? The hall was probabably full of lords and members of parliament, atlhough there probably weren’t many of them. John Chamberlain, the letter writer and assiduous collector of news and gossip was there. His inevitably discreet letter indicates other “hearers” and post-trial discussion. There’s also a much less discreet letter under the French ambassador’s name that refers to audience response. Mrs Stopes gives the letter in full in her bio of Southampton – in 16th century French! My modern French is very rusty, so I haven’t, as yet, got far with it. But I’ll persist, if only because the ambassador denied having written it. The trials very well-documented, officially and unofficially – and that’s just going by what’s available online. Would you like me to have a go at Mrs Stopes’ letter? My modern French is OK and I have read French from the sixteenth century, although that was at university. April, that’s really kind of you. Many thanks. But I’m plugging along quite well, and the exercise is good for my ageing brain. The letter is pro-Essex, blaming his downfall on his enemies. Easy to see why the ambassador denied having written it. Statements like “c’est la coustume des Anglois de se trahir l’un l’autre”, and references to “ces Milords” and “ce petit Bossu” wouldn’t have done anything for Anglo-French relations. Is that Sir R he’s calling a little hunchback? Even though it was true, it’s not very nice. I don’t like him already. Indeed it is. He doesn’t like Sir R. Someone leaked a copy of the letter to the English embassy in Paris, so Sir R would have seen it. The writer also refers to Messieurs les Pairs (the Peers) “bauffroyent” (stuffing themselves?) as if they hadn’t eaten for a fortnight before they returned to give their verdict. Well soused and addled with tobacco – “bien saouls et bien ivres de Tabac”. As well as tobacco they’d had beer and “confitures”. I don’t suppose they were eating jam – possibly that translates as “goodies”? So we know the Peers had something to eat – though if they hadn’t had a lunch break they would have been hungry when they withdrew to deliberate. Not that the writer thinks any deliberation occurred. ‘Confiture’ literally means mixed together, so it could have been almost anything, even something savoury. It was probably something sweet, though. A phrase that always sets my teeth on edge. The atmosphere in the hall must have been dreadful if people were smoking there as well. The peers withdrew for their repast – which made me wonder how the writer knew what they’d been doing. But he was writing a few days after the trial, so could have heard about the smoking from someone else. Perhaps the Hall still had a couple of roof vents, too. Wonderful account. I can see how nothing but ‘bacon’ would come to mind. Poor Tricks. Let’s hope that when supper is served she gets some scraps. ‘Kitling-brained’ – what a splendid phrase! I think there was a lot less worry over private/public when it came to things such as bodily functions in those days. Perhaps, as it still is in some parts of the world, people tended to just look the other way. I’m sure you’re right, Mick. And people wouldn’t have regarded Westminster Hall with the same degree of awe that I do. I think of that lovely one liner in “To Kill a Mockingbird “ – Mr Heck Tate had reserved the County toilet for Court officials. Looks like the next chapter will be a doozy. Hardly likely to inspire confidence in the defendants, whichever way it was turned! Being an executioner can’t have been a popular job. I’ve always admired the way cats can move their ears independently to pick up sounds coming from different directions. “Stereo ears,” a friend of mine used to call them. A trying time for the Earls, indeed. It seems earlier friendships or favours, attempted or granted, had little value in those times. It was a system of patronage from top to bottom. I think that sometimes the only alternative to changing sides would have been to go home sick and stay there for a while. Not something any ambitious fellow would have wanted to do. The secret to success was knowing which side to pick and when! But then, that still applies . . .